When the Cat in the Hat comes to town, you can always be sure of two things… and those two things just happen to be his handy-dandy helpers Thing 1 and Thing 2. They are always more than happy to lend the Cat a helping hand when it comes to playtime or cleaning up. Although just about anyone could tell you that those two definitely prefer playtime much more! So if you’re feeling like letting your whacky side loose this Halloween then get your hands on this Thing 1 & Thing 2 Costume for adults. Instantly transformed into one of the most memorable characters Dr. Seuss ever created. You'll be fully prepared to bring the party up to a whole new level of crazy with this fun-loving costume. However, there will be no need to fly kites around in the house or knock down everything in front of you while you run around. As much fun as that all sounds, it will just be a hassle later on. Instead, kick things up a notch with some wild dance moves and your best impression of the Cats mischievous pals! With this costume you’ll even be able to choose whether you want to be Thing 1, 2, 3, or 4. Once you Velcro the number you want onto your chest, let your awesome blue fro bounce every which way as you run all around and become the life of the party. 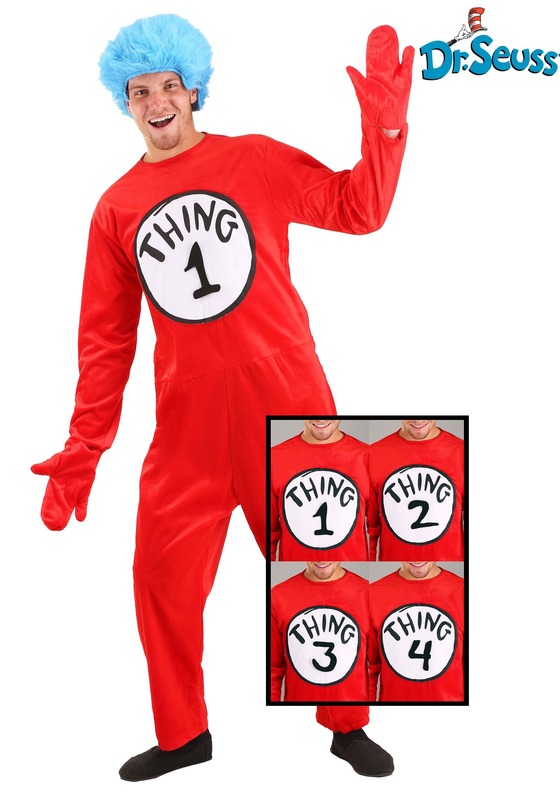 Grab a handful of your goofiest friends and have an awesome Seuss-themed Halloween.